I love healthy holistic gift giving ideas whether it's V-day, mom or dad's day, Christmas or just giving the gift of love. Nothing says love like something non-gmo, organic, eco-chic and fabulous! This is why I wanted to share a another giveaway with you just before the holidays from my organic havynn. 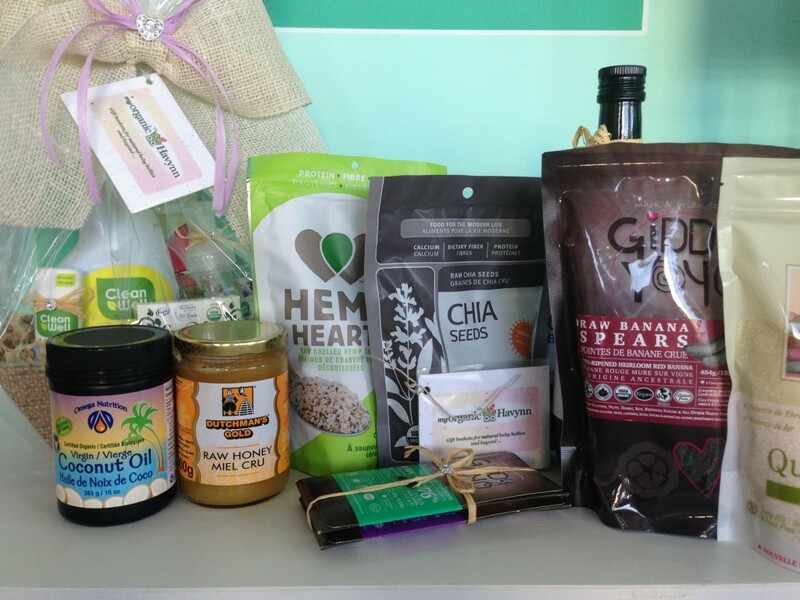 This is a company that provides holistic-approved gift baskets with truly wonderful items. "In todays over-processed world, we all need a little safe haven. My goal was to create just that. I was driven by the objective to develop a company that could make a difference. I trusted my idealistic convictions and created My Organic Havynn, Inc. The inspiration for my vision? Those 2 precious smiles; my son Kieran and my daughter Havynn (she is the inspiration behind our company name)". I was really excited when I got a few baskets myself to try out. I got "The Green Cleaning Basket" and "The Ultimate Superfoods Bundle". You can see the items in the following photos. Oh and the card that comes with each basket is plantable! New heathly habit? Minimize packaged foods that have a long list of ingredients. Keep it simple! I am 36 weeks pregnant and just having access to these super foods and clean products will give me peace of mind that my baby and body are receiving the best quality ingredients to nourish and nurture the rest of this pregnancy and through breastfeeding! I would swap some of my current cleaners to the clean well ones. I really liked the hand sanitizer product by them. I'd get rid of the cleaning chemicals in my home that I know are harmful! I would use them to get my two boys, aged 7 and 9, excited about healthy eating! Love showing that eating healthy tastes great too! I would love to switch to some green cleaning products!! This would be just the motivation I need! I would get rid all the toxic chemical laden cleaners we have and go all in with the 'good guys'. Being on a grad student budget it's easy to not buy organic - as much as I would like to! This would definitely help! I would love to pack up my cupboards with more superfoods! Also, I LOVE all the toddler baskets, I would love to get some for my little boy! I would love to make homemade granola using organic ingredients. My recipe calls for coconut oil which I do not have yet! I'm ready to clean out my cupboards and try some exciting new (to me) products that are healthy and inspiring!!! I would love to feed my baby boys ages 1&2 healthy foods... Because food is so related to mood! Less junk and more clean fun! This would be the perfect Christmas gift for someone in my family. It would certainly "push" others in the right direction of living and eating clean. I would certainly swap cleaning products because most that I use tend to give me headaches! I would take more time to pamper myself with all the organic spa products, which is a great way to relax, unwind and feel good at the end of the day. Also one can never have to many superfoods and Giddy Yoyo so would love to restock and have a never-ending supply. our whole household just recently went vegan. I would love to be able to incorporate some delicious organic vegan goods into our meals. it would be fun to know more about the options out there. This would be an amazing gift to receive as it will help me incorporate more organic foods into my diet and in my home. After learning about Joy McCarthy, I really wanted to change my eating habits. I would definitely be getting rid of white sugar and replacing it with sucanate sugar, white flours, etc, as I love baking! However, I want to start doing it the healthy way where I don't have to feel guilty about what I am consuming. I would love to try your cleaning products!...and continue making healthy dietary choices! would like to go fully raw and get rid of the meat, dairy, etc. I would add some organic foods to my pantry so I could stay healthy during the holidays and beyond. I am a senior living on a fixed income who is trying desperately to be able to afford more healthy unprocessed foods. I have pretty much given up wheat, dairy and sugar. I would love to be able to include more variety in the organic foods. The changes I would first start to make would be to reduce the toxins in my house. I just purchased my first home and my b/f buys the harmful chemicals for cleaning. I would love to have show him that we don't need those chemicals to make a clean house. The eating clean is my next step as he loves the packages foods!! I would buy the cleaning bundle and switch over some of the products I use to organic and clean ones! Something that's long overdue and necessary. It would be fantastic to win this amazing gift!! I just had my fourth baby and I'm still in recovery. She was born November 4th, she is a beautiful little thing and I owe it to her and the rest of my family to be healthy and strong so I can better take care of them. I know one of the most important steps to healing is eating the right food!! I have often told my husband.. I wish I was rich so I can buy all the clean food I want without reservation. We are a family of six now, and we often find ourselves on a budget. Winning this gift will definitely make a difference to me. I would love to use the GC to pick up some treats to make and share with friends and family over the holiday season. I would like to begin swapping out the chemical cleaners in my home for cleaner organic products. As for the food items, I would like to share them with a family member who could use some "persuasion" to make some healthy changes to her diet. This might just be the way of getting her "hooked" on real food as I have become after finding Joy McCarthy. I would love to use more chemical free products in my home that actually do a good job. I also would love to do the same for my body and my children's body by using clean food with REAL ingredients. I would spend my $75 on organic nut butters and non-sulphered dry fruit. Both of these are so expensive where I live! Oooh, so many things! Being an ND, i think I've got my kids on board with healthy living/eating (or they're too little to argue too much ;)), my husband however is another story. I'd grab any one of the 'my organic dad' baskets to make it super simple for him to live a bit healthier! I would love to start using organic skin care products! I would swap out the sugar laden unhealthy school snacks and breakfast cereals in our cupboard and replace them with much healthier choices and teach my granddaughter how to shop for foods that help build energy and vitality in her life. I'd swap all the processed food in my cupboards for $75 worth of clean eating :) With a 10mth old and another one on the way, I need to stay as healthy as possible! I would use it towards the Skin Essence box set, or get the green cleaning basket! It would be great to try out some new products. All the baskets look awesome. I love try new organic cleaners! The benefits are numerous; less impact on the earth and environment and healthier for me. I love incorporating super foods in my diet for the overall health benefits; my favorite being anti aging properties and immune boosting. I would definitely try the Ultimate Superfoods Bundle. It has some of my favourite foods and I would love to try some new ones. i would stock my snack and breakfast cupboard with more organic, superfood products! Replace my toxic beauty care products with cleaner products inspired by Joy's Natural Beauty Care Guide. I would use it for the Green Cleaning Basket. I am in the process of switching over to all green cleaners as I am finding regular cleaners cause me grief with skin irritation and headaches. A few small changes will make me feel better about what I am using to clean my house and know that I am not causing my body grief! I would put $75 from my organic havynn towards stocking my pantry with healthy staples, organic ingredients and treats. I love the idea of having all the ingredients ready and waiting for whenever the mood strikes to concoct delicious recipe! I have fibromyalgia so I would start by getting products that reduce inflammation. I would also use it to help alkalize my body. I have been getting frequent heartburn lately. I just bought an alkalizing stick from Santaevia! You recommended it so highly, I went and got one!! Thanks again Joy!! You are amazing! I'd buy the green home cleaner pack! I love organic home cleaning products. There are many things outside of my control when it comes to my family's health, but this is one thing I do have control over. Switching out some of our junk snacks for healthier ones. I just started to eliminate processed food from the diet of my family. Tomorrow is actually the first day we will be completely processed food free. My 6 year old boy has autism and I'm trying this to help him with his attention, irritability, and frustration issues...poor little guy. He told me last week that he feels yucky most of the time and awful all of the time...broke my heart...to me this is a necessity...$75 from Organic Havynn would be amazing! Thank you for your blog! I would give my gift basket if I won to this mom to start a gluten free diet. I could definitely swap some of our snacks for healthier versions, especially when entertaining. With the holidays coming up I need to think harder about familiar but still healthy foods to serve to friends and family that don't eat the same way I do. New healthy habits?! I've started a few on my transition to a healthier and better me. Eating as clean a diet as I can afford to, a consistent yoga practice, lots of additional fun physical activity, taking more time to myself... still working on managing stress levels better though! I would limit the amount of processed food in my house - and throw out all those harmful cleaning products I have! I would swap out my regular trail mix for some new and exciting organic snacks. Hi Joy, this is so easy. For $75 I would swap all the chocolate in my pantry for Giddy Yoyo!! :) Like the label says.. it's food not candy. Seriously, the best in the world! I'm in the middle of a detox and would love to stock my cupboards with healthy super foods to maintain my good habits after this process is complete. There are so many recipes I want to try out that call for the more "specialty" items and being on a budget it's difficult to go out and buy all of them at once to test out the recipes. This would be a huge help! It would be great to have some new, healthy and delicious treats to bring to my family over the holidays to show them that clean and natural eating can be both delicious and nutrition. They are not quite on the band wagon yet. I would use non chemical cleansers in my home and start snacking healthy! I would use the raw honey in my green tea! I would start baking GF from scratch with alternative sweeteners. No sugar, no wheat no dairy, is it possible? I would splurge on all of the wonderful bath products for my 2 kids and myself. After my big grocery bill from buying organic, I find I often don't have extra money to put towards luxurious products. This would make a really cute Christmas gift for a friend or family member ! If I had $75 to spend, I'd replenish the toiletries for my 5 & 6 year olds. Organic/chemical free toothpastes, soaps, shampoos, body washes, etc. they love trying out new things that won't hurt them! Stop using scary chemical cleaners and use vinegar and lemon more often! And replace my personal care products with clean ones. I've really cleaned up my diet but the transition to clean personal care has been more tough due to the cost. I have already stopped drinking milk & make my own Almond Milk. I would use organic, raw almonds for this. Eat more fruits & vegtables & dairy free chocolate. Going more gluten free & soy free. I would also add more exercise to daily routine also. I like to bake bread, so I would swap out regular flour for whole grains and seeds and other ingredients to make the breads organic and wholesome. A healthy and safe bath routine for my little one. Natural soap, toothpaste, homemade massage oils to relax and soothe. I would love some superfoods in my life! I always feel guilty that I'm not incorporating them into my diet and I think this would be an awesome place to start! On-the-go snacks, especially for my children. Fruit is great, but sometimes I'm late (ok, maybe more than sometimes!) and kids want fruit cut up!! So healthy quick snacks that I can gab and run out with!! On-the-go snacks! These are probably my biggest weakness - for me & kids. When I'm late rushing out the door, being able to grab quick, health snacks is important to me - and not those fake yellow fish crackers!! I would love to put it towards the 'Toddler Birthday Bundle' for my little girl who's turning 3 in less than a month. She loves Annie's and Mary's and I would like to try the banana spears. Plus, who wouldn't love some Giddy Yo Yo chocolate bars :) These baskets look like great gifts and I may just have to get one for someone else that could use a little lift-me-up as well as positive changes in their life. Hi Joy, I woud love to buy different organic herbs from organic havynn. They have a great selection! I really enjoy cooking and living in Toronto doesn't allow you to maintain a garden in the colder months. It would be great to reach for fresh herbs and adding them to the foods that I love! Thank you for the opportunity to win this wonderful gift! I love buying healthy organic products! This is an exciting opportunity….thank you so much for this gift!